I write those two words with almost the same level of trepidation that I would if I were texting a friend whose birthday I’d missed (something I did last week, actually). Everything is such a blur at the moment. But I still feel like I “should” be blogging…should be updating and encouraging and sharing with you. In the past, I don’t think I couldhave gone a week without blogging without a significant level of guilt because I’m a dutiful sort, and I feel “bad” if I don’t do what I say I will…even if no one else is requiring it of me. HOWEVER, I know that you all are busy too–that you understand that some seasons in life are more hectic than others and that you would agree with me when I say that my priorities are better now than in the past when I might have forgone something more important than blogging just for the sake of fulfilling some sort of misplaced duty. Even so, I miss you guys. I miss writing. And I’m sorry that I’m not doing a better job of balancing all of the things at the moment. To make up for and distract from my shortcomings, I am posting pictures of Mr. Theodorbs himself in the midst of the Great Raisin Heist of 2017 (aka: what you have to resort to to get a snack around here when Mama is distracted by cleaning/organizing/rearranging all the things that seemed perfectly fine to you to begin with). This little boy is like no other of my children so far (true of each, but, in some ways, especially true of him). He is mischievous and happiest when either a toy sword or stick is clutched in one plump fist (or both). He is noticeably athletic–leaping, throwing, catching, and running with a coordination that belies his mere 27 months. He’s reached almost every milestone earlier than any of the others. He is SO cheesy and hammy. Definitely the most theatrical of a bunch of rather UNshy and drama-prone children. He still has his sweet, soft, lisping voice–except when he’s hurt/scared/just plain mad as a hornet…in which case he uses the exact same level of volume and ear-scratching rasp to express all of his woes (makes it a wee bit difficult to discern between “bleeding to death” and “he looked at me wrong”). And, even though he has his “days,” more often than not, he is a welcome source of smiles and chubby-armed hugs in the midst of the crazy that is trying to get a house ready to sell, finish building the other one, homeschool (including attending our homeshool co-op), teach fitness classes, and put something decent on the table for dinner most nights. Oh yeah. And feed a newborn every 2-3 hours. Speaking of the new house, the loose plan is to shoot for moving in in about 3 months. That is, if this house sells quickly (only the Lord knows). If it takes a while to sell, we’ll just keep plugging away at the new one. Regardless of when we sell this one (unless it’s a year from now), we’ll be moving into an unfinished house because, even with all of the incredible progress Shaun has made, there’s still a lot left to do. But we have lined up some tradesmen to finally start doing some of the work (he’ll still be working every chance he gets…just in different areas of the house)–especially key as he’s about to start a round of work trips that will significantly decrease his ability to get things done out there. The plan–Lord willing–once we get our current house on the market (hopefully this week) is to spend as many evenings as possible at the new house as a family–cleaning, caulking, puttying, sanding, and doing anything else that might lessen the load and expense for any workers that come out. To that end, I really need to figure out some travel-friendly meals to plan ahead for those nights. We have a small fridge there, and Shaun will hook up a stove for us to use, but it won’t be anything like a fully stocked kitchen, and most nights, we’ll be stopping at the new house to work on our way home from my teaching at the gym. So! Any brilliant ideas you have for easy, portable, reheatable, nutritious meals would be greatly appreciated. 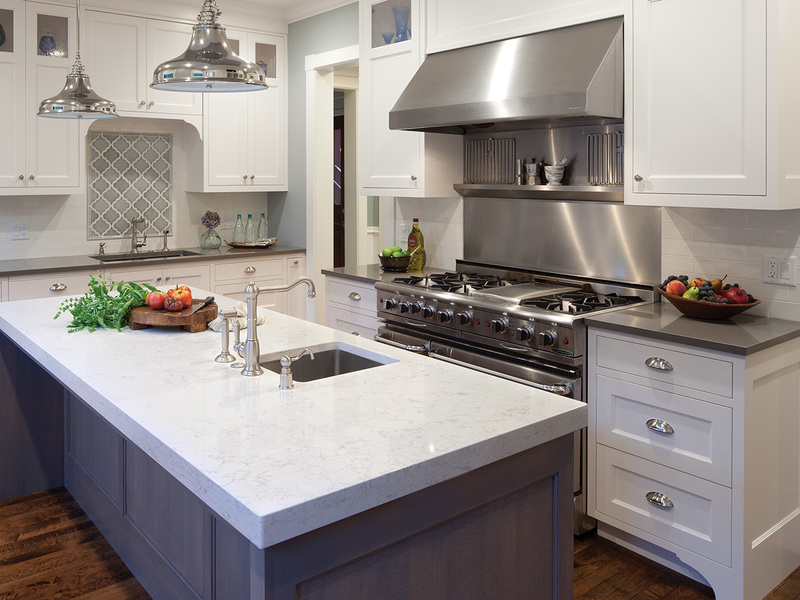 In other news, we’re seriously considering going with quartz on the countertops after all. The manufacturer we were planning to use to fabricate our laminate countertops is no longer available, and let’s just say the samples I’ve seen of the laminate edge I want from local guys have left something to be desired. We’re still not set, but we’re leaning toward Torquay by Cambria, which comes in jumbo slabs, which we’ll need for the length of the island. Even so, we’ll have to shorten the island by a little over a foot, since the longest option is about 132″. That’s it above, and the color is a pretty white with gray/tan veining that more or less mimics the look of marble. We’ve gotten three quotes (well 2 wholes and 1 partial) so far. The first was eye-bugging, the second reasonable, and the third hopefully a bit of a steal (we’re waiting on them to come back with what they will charge for the quartz itself; but their install price per sq. foot is almost half of their competitors). Aaaaand there you go: an update of sorts for the goings-on in these parts. The good news is that I’ll have to take pictures of our entire house for when we list it, which means you’ll get a more detailed HOUSE TOUR than any I’ve yet shared in–oh–the last six years. Which means you’ll finally get to take a gander at our master bathroom–something I just know you’ve been hankering to see. Ahem. Anyhoo. Get excited. If we’re all lucky, I miiiiiight post a room or two sometime later this week. For my family, I have discovered rice bowls. I cook a large quantity of meat on the weekend(sloppy joe meat, pork loin,etc). I have a rice cooker. On a busy night, I reheat some meat and cook up some rice. I put the meat on top of the rice and add a veggie. My kiddos like peas and carrots and I like green beans. Then, I have one kid that likes soy sauce and the other two like teriyaki sauce. You can adapt as needed. Best wishes on your move! You should check out LG quartz Cirrus. It’s a great option for a marble-ish look. We had picked out a Cambria slab and when we started getting quotes we found cambria is expensive merely for its name & several fabricators where I live won’t sell it due to its bad quality for how much it costs and cambria hadn’t stood behind their product so they stopped working with them. The LG has the super slabs which I needed for my 11 ft island and I was adamant about no seems on my island!! The slab cost was less with LG and it’s beautiful!! I’ve had three friends put it in their kitchens after seeing mine. Enjoying following your build. We are doing a full gut renovation, it’s been a long nightmareish ordeal. Good luck with the house selling quickly!! Hoping you get a buyer quick so you don’t have to live “show” ready for long. So my dinner ideas are soup and sandwiches. A pot of soup in a cooler and just stick it on the stove to warm when you get there. And hot sandwiches, deli roast beef with a can of AuJus (??) and just mix together and heat and serve on nice rolls with pepper pickles . Or Pioneer Woman’s Marlboro Man Sandwiches where you need a stove and fry pan (I never heat them in the oven) -we like to add all the stuff, peppers, mushrooms etc. I can’t imagine how tricky this all is. We may be selling our home soon and the idea of us living here while it being company ready at all times makes my eyes cross. I’m doing a big yard sale just to cut down on junk so either way we have less stuff in the house. Praying for you! Do you have an Insta-pot yet? It may be a life-saver for your family. They cook things (by pressure) in record time. A whole chicken in 30 min, etc. There are cookbooks devoted to one pot meals… it seems like a good solution for healthy, yet fast and convenient meals. Also, we have Torquay in our kitchen and it’s really beautiful and light! I loved the look of marble, but with 3 boys, it’s way too high maintenance. This is low/no maintenance, although it has chipped in a few areas (read: boys) Can’t wait to see the new house progress! I’m sure you’ve done your research on counters but I wanted to share what we did. Marble was the “look” I wanted but price and practicality are most important. Anyway, I went with a quartzite usually sold as a granite, called Fantasy Gray. I got the piece with the least movement they had. Its close to a marble look, very neutral with mostly grays, creams and tan. Very little tan on my slabs though. I wish I could attach a pic for you to see! Good luck selling the house, I bet it goes quick! Go with the quartz, you wont’ regret it! I LOVE LOVE LOVE my quartz counters I’ve had them for 8 months and put them through the ringer of a well used kitchen. They are a very light color and have resisted staining from red gel food coloring spilled directly on them, a wine spill left overnight, olive oil, coffee and who knows what else. We have a youth bible study with 20+ kids at our house each week and there are constant snack and drink spills and nothing has phased these beautiful countertops. They are pricey but also probably the last countertops you’ll ever buy! 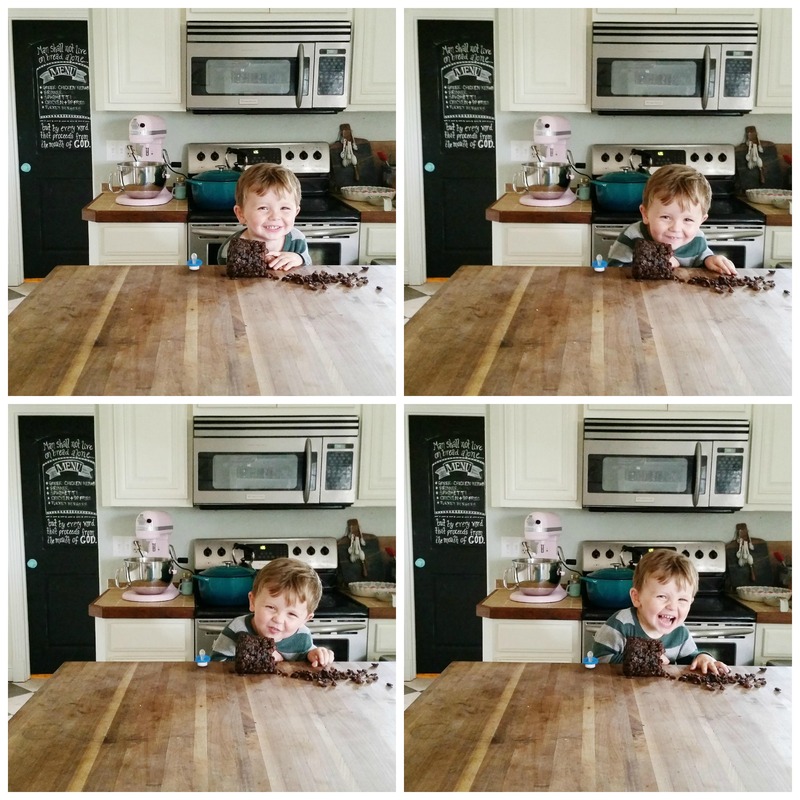 Theo and his raisins pics are so sweet! I’m thinking along the same lines as Jennifer K that crockpot meals would keep it easy. Taco soup is an easy one we like: 1 jar of salsa-any normal size (not Costco size), 1 can black beans drained, 2 cups or so frozen corn, a dash of cumin and chili power, 2-4 cups chicken broth depending on how stew like or soup like you want it, place a few boneless chicken breasts on top. Cook for a few hours on low or high depending on your time frame. After chicken breasts are cooked take out and shred than return to crock-pot. We like our soup topped with corn chips, sour cream, and shredded cheese. In our family this recipe feeds two adults and three children. So for dinners on the go, I’d recommend doing the crockpot thing. Put ingredients in a crockpot liner, then into a small cooler to hang out in the car when you go to the gym. As soon as you get to the new house, plug it in and forget it until dinner smells done. You can do stews, soups, pot roasts (and sides), meatballs – basically anything. If you have one of those seal and go crockpots, even better. If you can’t plug things in at the new house yet, you can get those car battery chargers (we use them in case of emergency anyway) and plug it into that. That way you could even have it cooking while you’re at the gym. Hope this helps! Hey, Abbie — I don’t know how “portable” the recipes are on my website, but they are free to download and print. You can make meal plans and grocery lists very easily. There are no pesky ads to deal with:) You may wish to check it out. Very user friendly and all FREE. Thanks for the lovely update. Love your blog! !